Dark Horse Comics has long held a reputation as the foremost publisher of comics that go bump in the night, from rollicking demonic epics like Hellboy to sinister frights like House of Penance, but nothing in their library is quite like Beasts of Burden. Created by Evan Dorkin and Jill Thompson, and later illustrated by Autumnlands co-creator Benjamin Dewey, Beasts of Burden follows the paranormally attuned dogs and cats of Burden Hill, a small town with a disproportionate amount of hauntings and afterlife goings-on. Scooby Doo this is not—the “Wise Dogs” and Wise Dogs-in-training of Beasts of Burden have met grisly ends occasionally throughout the series, but Dorkin’s impassioned scripting and Thompson and Dewey’s luscious, painterly artwork should endear Beasts of Burden even to those of us who still nurse Old Yeller trauma. Like its Dark Horse sister title Hellboy, Beasts of Burden has maintained a series-of-miniseries publishing approach, and the newest entry in the BoB saga kicks off May 1st. Featuring art by both Dewey and original co-creator Thompson, Beasts of Burden: The Presence of Others is a two-issue miniseries that kicks off with a team of (human) paranormal investigators disturbing a grave and unintentionally making things very dangerous for the series’ animal protagonists. 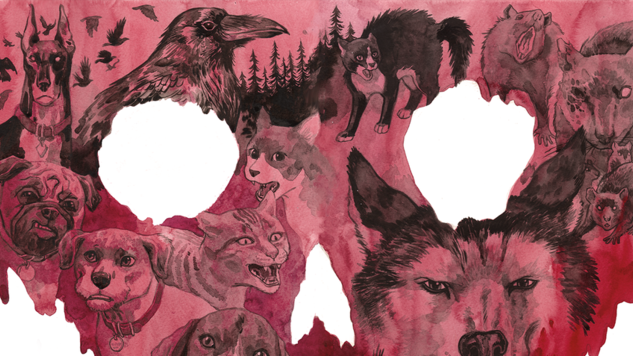 Paste readers can get an exclusive look at Thompson’s interior pages below, and can grab the first of two issues of Beasts of Burden: The Presence of Others from comic shops and digital retailers May 1st.